The post below surveys the evolution of Guatemala’s cuisine. Feeling tired and peckish after a day’s worth of interviews, I settled for a sweetened cup of coffee accompanied by warm, corn tortillas smeared with creamy guacamole. While these foodstuffs (i.e., coffee, corn, and guacamole) are delicious, they represent three influential culinary periods on contemporary Guatemalan cuisine: the Mayan Empire (300-900 A.D.), Spanish rule (1524-1821), and the modern republic. The majority of contemporary Guatemalans trace their heritage back to the Mayans and their indigenous diets. Ancient Mayans ate beans and corn in addition to squash, tomatoes, chilies, tropical fruit, cocoa, and wild game. In 1524, the Spanish arrived and introduced rice, citrus fruit, olive oil, and garlic. During their rule, the Spanish also incorporated typical dishes such as enchiladas, guacamole, tamales, and tortillas into the Guatemalan diet. After independence from Spain in 1821, Guatemalan cuisine changed little, with the exception of the mass production and consumption of coffee and bananas beginning in the late 1800s and sugar in the mid-1900s. 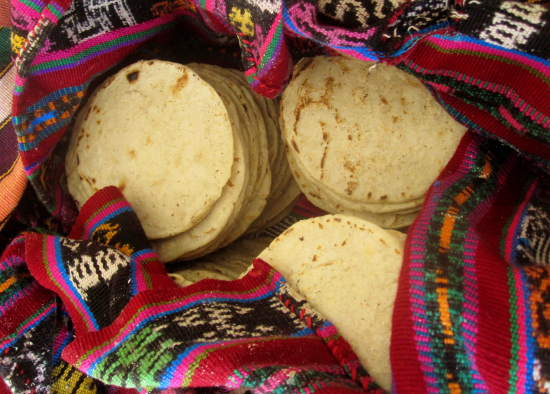 Today, Guatemalan cuisine is a blend of indigenous and Spanish ingredients and cooking techniques, creating a unique culinary experience. Stay tuned for the next post on Guatemalan Eating Habits & Patterns to see how and what a typical Chapín eats. *Chapín is an affectionate term Guatemalans use to identify themselves. It is believed that chapín was a type of shoe worn and popularized by Guatemalans during the 17th Century.